INTERACTIVE THEATRE EXPERIENCE IN THE APR THIS SATURDAY 8th of JULY 2017. The critically acclaimed iAm4.0 explores our attachment to technology, and the human cost we are willing to accept in the digital age. Most of us have accepted technology as a practical way of improving daily life. Yet we’ve all caught ourselves shouting at Siri or berating Sat Nav as if they were humans. The gadgets we rely on play a more emotional role than we like to admit. The performance is set up as a ‘secret focus group’ testing the latest technology, allowing the participants to explore themes of attachment and how we now communicate. 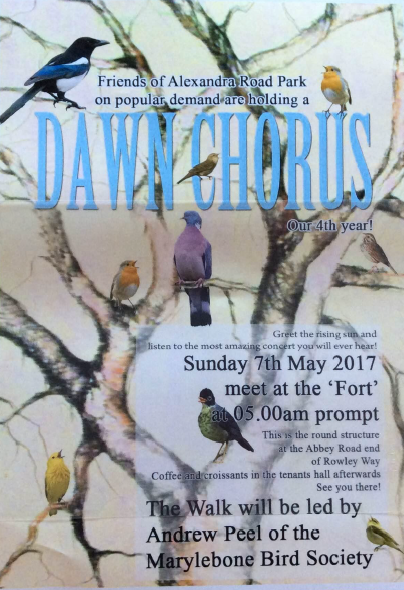 For the fourth consecutive year, Andrew Peel from the Marylebone Bird Watching Society will lead a dawn chorus walk through Alexandra Road Park, NW8. Come and meet us at 5 am by the “Fort” at the end of Rowley way, on the Abbey Road side of the Estate. The walk will take around an hour as we will be stopping and listening as we go. Andrew will help us to identify the birds that live in the park and to hear their individual songs. Children are very welcome on the event as long as they are accompanied by an adult, but please be aware that it may not be suitable for younger children as it will be important for the group to stay quiet during the walk. The walk will be followed by a light breakfast in the Tenants Hall. This year our unique modernist Alexandra Road Park is amongst the 200 gardens which take part in Open Garden Squares Weekend each year. Open Garden Squares Weekend is organised by the London Parks & Gardens Trust (LPGT), who work to protect and promote London’s green open spaces. There will be guided tours throughout the day between 10 am and 4pm. The Estate’s Tenants Hall will be open, with tea and cake for sale and a display of photos and videos about or featuring the estate. 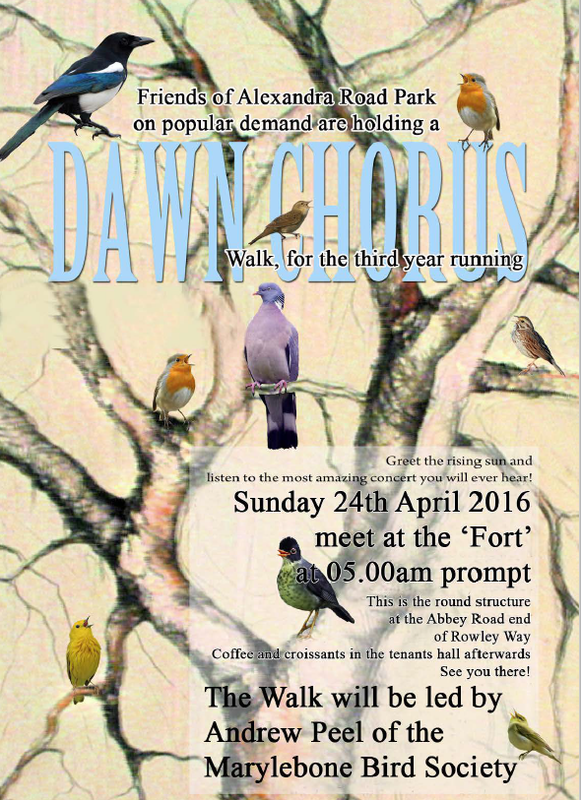 DAWN CHORUS WALK ON SUNDAY 24th APRIL 2016. JOIN A VERY SPECIAL EVENT! 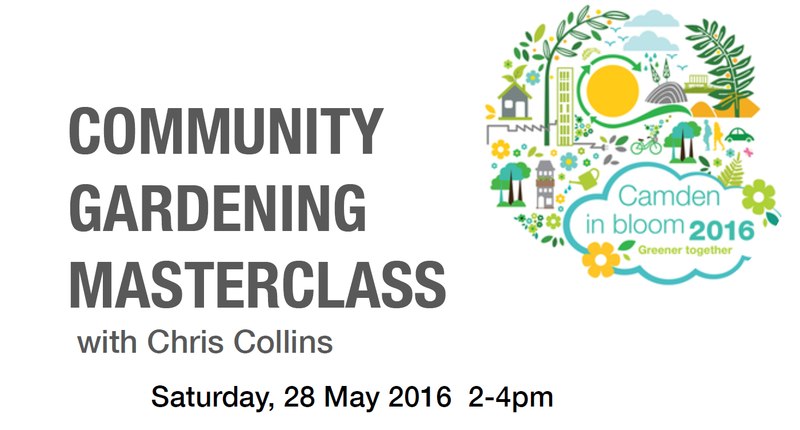 Andrew Peel from the Marylebone Bird Watching Society will lead a dawn chorus walk through Alexandra Road Park, NW8. This will be free to attend. It is the third time we have run a bird watching/listening event in the park and the last one was very popular. The birdsong is best heard at dawn itself, so we will be starting at 5.00am! It’s an early start, but this is a unique chance to find out more about the birds that live in this area. Please be at the meeting point at least 5 minutes early and make sure you are dressed warmly and wearing sensible shoes. We will meet-up where Rowley Way meets Abbey Road, by the “Fort” which is the circular seating structure next to the road. And feel free to tell your friends and neighbours about this event. We hope to see you there! There are plenty more events and activities for people of all ages going on in the park from outdoor yoga, cricket sessions to dawn chorus walks in the park. Find out more by clicking on the poster below. 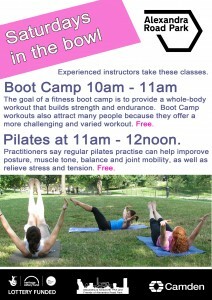 Keep fit and enjoy the park with the free fitness classes. No need to book just turn up! Since the end of the restoration works in August 2015 we organized the park opening event attended by local residents, friends of the park, local youth clubs, Camden and Lottery Fund representatives. If you have an idea for a suitable activity in the Park get in touch with the ARP activities Co-ordinator, Hannah Bennet. She is responsible for delivering a programme of activities as part of the Heritage Lottery Fund plan for Alexandra Road Park. The activity programme is about connecting people and enabling them to get to know more about what they can do and how to get involved in managing the park’s activities.